Based on the latest developments in transport solutions for bikes by B&W International, the bike box II manages to improve on almost every function of its predecessor. In addition to the new design and features, production effort was reduced and made more resource friendly. This has also resulted in a weight reduction of 1.4 kg, which is vitally important for travelling by plane; and all of these improvements without any increase in price. The bike box II is suitable for racing bikes with a frame size up to 62 cm and hardtail mountain bikes with a frame size up to 46 cm. 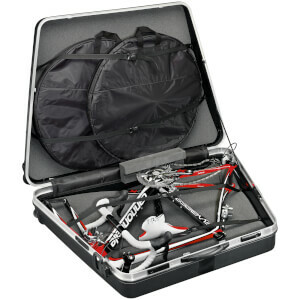 The bike is attached to the inside of the case using straps and optimally protected by several foam inserts. Both case shells interlock at six points and are closed using a self-tightening strap system. Two carrying handles, two pull handles and four robust low friction castors make manoeuvring the box simple. Great product at a great price. Everything included. My 54cm road bike fitted perfectly just removing the bars and pedals. Easy to pack and bike survived 18,000kms without a scratch. With airlines restricting the weight of bike carriage this bix is a good option. ProBikeKit are reliable but UK Mail couriers should go out of business! Used the box for the first time to take to Tenerife Came out the other end unmarked, very easy to move on the 4 wheels, plenty of handles to grab to lift it off baggage belt and from car and bus, straps hold secure, plenty of room for bike, helmet, bike clothes, shoes and tools. The top half of the bike box takes a bit of time to get on the first time you try to fit it in position, so have a dummy run, after that it is easy to get it together,. I would highly recommend this box. After doing research for bike box’s, you cannot fault it for both value and design. Highly recommended. This is my second attempt to write a review of this bike box. PBK decided not to publish my first as it wasn't very positive. I would advise against buying this product. It is two very cheap and flimsy plastic lids that don't fit together very well. Once together, there is no crush protection and anything placed on top of it in a baggage hold would crush the contents. I have used it a couple of times and the plastic has already cracked. I'll be asking for a full refund under warrantry. This is a poor attempt by B&W. The original B&W bike box was a strong effort save for the wheels which meant it only went in straight lines, however, its second iteration lacks so much that made the first one a half decent budget bike box. To summarise. The box is made out of cheap plastic that is brittle The box is two shells that you clamp together with straps. There is no hinge It comes flat pack, you have to assemble yourself Everything about it is cheap/low quality The assembly of the box is tricky and not as simple as just closing it (like you would if you had a hinge) In short, spend a little more and buy something that will last because i have my doubts that still will last more than a handful of trips. Box used on flights. Just under hold baggage allowance 23 kg with 58 carbon bike, pedals, helmets gloves, spares and empty bottles. Boxes rigid, strong and secure when closed. Can be locked. Internal padding and bags and fixings all good. Easy to wheel/ steer. When split can get half cases through loft hatch for box storage. Happy to recommend.